Zong brings, for the first time in Pakistan, Zong Directory. ZONG Directory connects you to businesses in Pakistan. Find company listings, search local businesses, products and services, with Zong's motto "if it's in Pakistan, it's on ZONG Directory". 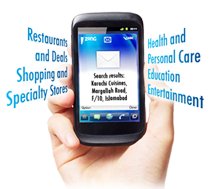 With this unique service Zong customers can find information by entering any 'keyword' like "PAKTRON, Islamabad". Moreover Zong customers can also subscribe to the latest deals and offers of their favorite places in their own town. Search: The customer will send the desired place, city e.g. MacDonald’s, Karachi to 5005 through SMS. Subscription: The customer can subscribe the latest deals and offers of the following categories by a push SMS. In order to deactivate the subscription please write "unsub" and send it to 7700.